Roadrunner Records’ group WE ARE HARLOT have unveiled details of their long awaited self-titled debut album. We Are Harlot – which features the blistering lead single “Dancing On Nails” – arrives everywhere on March 31ST. Pre-orders are available now via iTunes and www.WeAreHarlot.com. Furthermore, WE ARE HARLOT – fronted by vocalist Danny Worsnop and guitarist Jeff George alongside bassist Brian Weaver and drummer Bruno Agra – have premiered their new music video for “Dancing On Nails”, the first single off their anticipated LP. The official video is streaming now right HERE. For more videos and updates please visit the band’s official YouTube channel (www.youtube.com/WeAreHarlot). 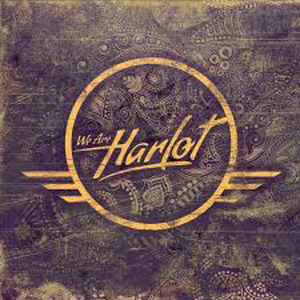 Recorded at Steakhouse Studios in North Hollywood, CA and produced by Kato Khandwala (THE PRETTY RECKLESS) along with Worsnop, George and Agra, WE ARE HARLOT showcases the bands larger than life personalities and unrelenting desire for fun. Their mission to revive Rock N Roll is evident from the get-go as Worsnop’s swagger and power commands attention, while George’s guitar oozes with style and feel and Agra/Weaver provide the rhythmic flow and backbone for the album. “Denial”, the first track to be released off the record earlier in 2014 caught the attention of global entertainment company WWE, which picked the track to be the new theme song of its flagship television program Monday Night Raw. Other album standouts include “Dirty Little Thing” and “Someday”, which highlight WE ARE HARLOT’s staggering versatility and see them fearlessly blasting off into a new stratosphere with power and excitement. WE ARE HARLOT are also set to make their return to stage in 2015 following their stellar live debut at Rock On The Range last year. The group is officially set to perform at an array of North American spring festivals, including such eagerly awaited events as Ft. Myers, Florida’s Fort Rock (slated for April 25th), Jacksonville, Florida’s Welcome To Rockville (April 26th), Concord, North Carolina’s Carolina Rebellion (May 3rd), Somerset, Wisconsin’s Northern Invasion (May 9th), and Columbus, Ohio’s Rock On The Range (May 15th-17th) with additional dates to be announced soon. For more information on upcoming tour dates and tickets visit www.WeAreHarlot.com. For more information, please see www.weareharlot.com, www.facebook.com/weareharlot, www.twitter.com/weareharlot, www.youtube.com/weareharlot, www.instagram.com/weareharlotofficial and www.roadrunnerrecords.com. "Flying Too Close To The Sun"